I have professed my love of figs before but I simply must do it again. I just devoured a lovely bunch of them and I'm already missing their exotic flavor. I love their shape, their color and of course, their taste. I like them with almost everything and by themselves. I also love fig scented everything - soap, lotion, candles etc. They are an exotic fruit don't you think? Good old Wikipedia informed me "The edible fig is one of the first plants that was cultivated by humans." The ancient Egyptians, Greeks and Romans loved them and they are one of the highest plant sources of calcium and fiber. Go Figs! Here's the thing - I didn't taste fresh figs until I was in my 40s. Seriously. I have no idea why but there it is. Discovering the joy of fresh figs after all these decades of life reminds me of all the other wonderfully delightful tastes, sights and adventures just waiting for me out there. What a wonderful journey this life is. Is it weird at all that I have no idea how figs taste or smell? The verdict is undecided, on whether I like figs ... but the fig tree I LOVE. I sat under a HUGE, MASSIVE fig tree this summer (in Troy, Turkey - the Romans & Greeks probably ate the figs off that tree :)). Not only was it impressive, the smell was divine. Maybe I will try a fresh fig, now that I have fallen for the tree. I'm more of a vegetable person than a fruit person, but I'm coming around. Maybe I taste a fresh fig soon? 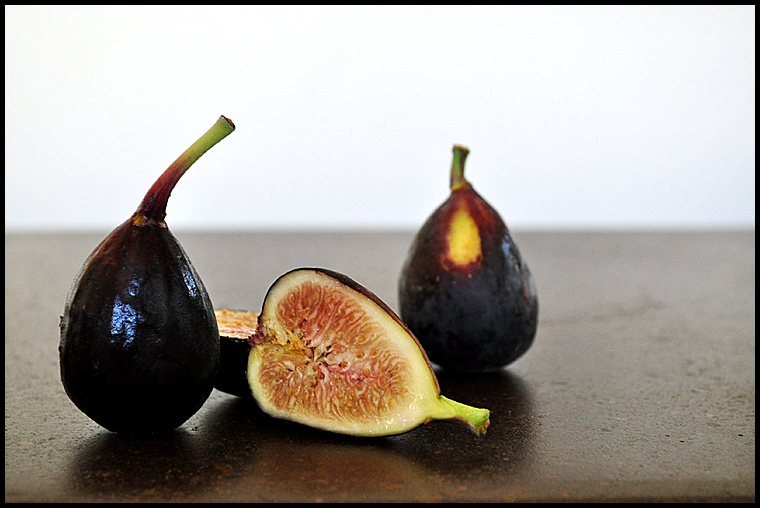 I only tried figs a few years ago when we were renting a villa in Nice and they had fig trees on the property - yum! Dates yes... so fattening! I'm not sure about fresh figs, I have eaten a few Fig Newtons! Okay, I shall try fresh figs soon. Re trying new things - as a child I was a very fussy eater. As an adult (30's onwards) I have had the pleasure of discovering numerous wonderful foods, both in taste and nutrition value. Yes, this life is full of such discoveries! Preaching to the choir here - can't even tell you how much I adore figs - and like you, I adore fig EVERYTHING!! In fact I just got a fig Diptyque candle - lovely!! Actually I don't think I have tried anything new recently- I'll need to amend this soon- I do love figs though. i love them in salads with goat cheese... YUM! Fresh figs are pretty new to me as well. The closest I ever came to figs previously was in a Netwon (which I used to LOVE). I grew up with a fig tree hanging over into my yard from the neighbors! Yummmmmm!. She used to make jelly and preserves for us! Mmmmmm. One of my favorites today is goat cheese and fig on something breadlish and toasted! Have not tried much new lately - but now I am craving some figgy toast - gotta go! Hm, I have never tasted a fresh fig before. In my country we get them dried and eat them at christmas but I dont like them like that. Maybe try them fresh? I don't actually like figs, but like your second commenter Sara, I have a fondness for the tree. One of my happiest memories from my late twenties, is standing under a gigantic fig tree that I loved in the backyard of a quaint old rental property with my sister-in-law divulging that I might be pregnant at last - and it turned out I was! Last summer, while in DC, I had fresh figs, right off the tree. It was fantastic. You and I share a love for the fruit! Great post, Jeanette and it did bring to my attention the fact that I never have had a fresh fig. (Hanging my head in shame) I will try to rectify that today! My fave way is with goat cheese on them. One of my best memories of figs is when I went on a long weekend trip to Miami Beach with 2 girlfriends. We were staying at (?? i can't remember name? Something Shore????) ANyways, every morning around 10:00 we'd get our space by the pool. And every day i'd order the fresh fruit and nut plate. it was HEAVEN ON A PLATTER. Every kind of fruit, cut up, and TONS OF FRESH FIGS, sliced in half, with honey and nuts, and cheeses.... oh I could go on and on. Sitting there eating honey & figs I just felt like a modern day cleopatra. i want to try this lettuce from Turkey that Dr. Oz talked about. will have to let you know if i find it.